Due to a special stipulation in her will, deceased comedic actress Bea Arthur is speaking out against animal cruelty. 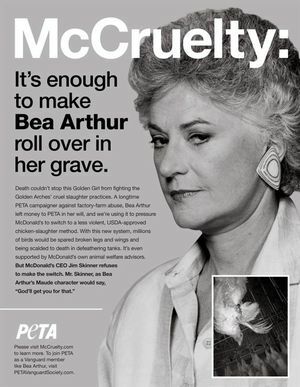 As part of their McCruelty campaign, PETA is using images of Ms. Arthur, a.k.a. Maude, Dorothy, et. al. in new ads appearing in the Chicago Tribune. The world of planned giving is an area of estate planning and charity and philanthropic work that is sometimes overshadowed by the more splashy details of a will involving heirs and final disposition preferences. There are various organizations out there in the planned giving universe such as the stuffy-sounding Partnership for Philanthropic Planning. But in exploring a bit out on the web, we discover the lighter side of the biz. Posted by Kim in Death + Humor, Death + the Law and tagged planned giving, wills. Bookmark the permalink.